Ontario's animal welfare agency is seeking information from the public after a severely malnourished dog was found beside the body of another in a garbage dumpster in Ottawa's west end. Ontario's animal welfare agency is seeking information from the public after a severely malnourished dog was found beside the dead body of another in a garbage dumpster in Ottawa's west end. The city's bylaw department received a call on Nov. 22 about the emaciated pit bull-type dogs, which were found abandoned near Draper Avenue and Morrison Drive, the Ontario Society for the Prevention of Cruelty to Animals (OSPCA) said Wednesday. One of the dogs, estimated to be one year old, was found dead. The cause of death is unknown, the agency said. 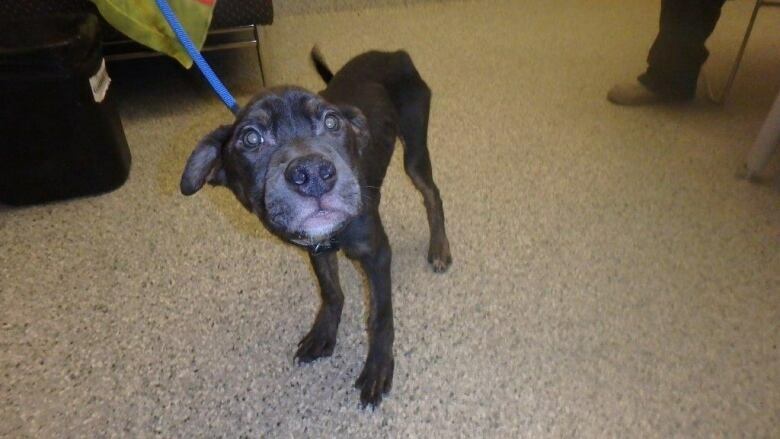 The surviving dog, also about one year old, was taken to a veterinary hospital in very poor condition. The Ottawa Humane Society has since helped place the animal in foster care, the agency said. The OSPCA said it's trying to find the owner of the dogs in order to determine how the animals ended up left in a dumpster. The agency said it's also trying to determine if there's a connection between that discovery and two similarly emaciated dogs found running loose more than a week earlier. On Nov. 12, a six-month-old dog found near Beechwood Avenue and Ferland Street in Vanier had to be euthanized because it was so emaciated, the OSPCA said. The next day, another emaciated dog, also six months old, was brought to the Ottawa Humane Society after it was found in Brockville, Ont. That dog is currently recovering in foster care, the OSPCA said. "If you have any information about any of these dogs, we urge you to report that information so we can follow up accordingly," said Lynn Michaud, a senior inspector with the OSPCA. "We want to determine who owned these animals and the circumstances surrounding the condition in which they were found."